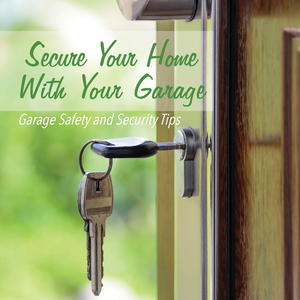 Garage security is necessary to protect your home and your property. An unsecured garage is a gateway into your home for unwanted intruders. You may also have items such as power tools and sports equipment stored in your garage. They are valuable to thieves. Overhead Door of San Angelo makes secure garage doors in a large variety of styles and materials. Traditional wood, fiberglass, and steel along with other materials provide safety and security. All of the doors close tightly and they can be opened with automatic controls. Yet, additional security is highly recommended around the perimeter of your home. 1. Make sure your garage is connected to your home alarm system. Many homeowners have an alarm system for doors and windows but they neglect to include the garage. Attached and detached garages should be part of the alarm system for security. 2. Install automatic sensor lights and even video cameras in front of your garage and front door. You can monitor the cameras on your smartphone with some systems. You may use this for your doors and windows but don't forget to add the garage. You may want to consider sensor lights and a monitor for a side or back door to your garage. 3. Install an automatic garage door opener and closer that can be controlled remotely from an app on your smartphone. There are many garage security systems available that will give you remote control for garage access. They can be connected to your home alarm and monitor systems or used separately. 4. Keep all doors closed and locked, even when you are home. Keep the garage closed when you are not in it. A curious crook may walk or drive by and look over your garage and try to find a way into the house for future reference. Use blinds shades or frosted glass on any side garage windows that can allow someone to look into the garage, especially when your vehicles are not in it. 5. Hold a yard sale, not a garage sale. Do not allow strangers to check over your garage while you are holding a sale to unload tools, sporting goods, garden equipment, and other items. Keep that door closed at all times when strangers are on your property so they do not see the bikes and other items in your garage. Contact Overhead Door of San Angelo for the finest quality garage doors for your home.